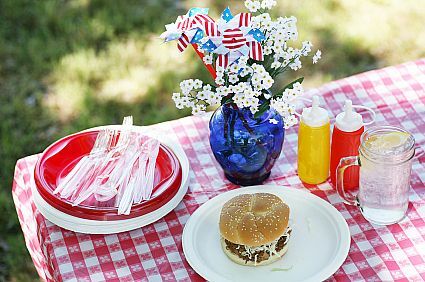 The Fourth of July is soon approaching and with is comes lots of food, friends and fun. Take this opportunity to add some green to your red, white and blue festivities. While the best thing to do would be to use washable plates, cups, bowls and cutlery we know that this is not feasible. But what works at my house is to write names on everyone’s cups as they arrive and to use bottled beverages instead of cans. When cans are used its impossible to tell one can from another and when we loose our full can of soda in the sea of other cans…what do we do…we get another. Bottled drinks cost less and help people to waste less. Planning a barbeque in the middle of the day means your guests are less inclined to stay outdoors and more likely to head inside with their plates. Take advantage of cooler evening temps by starting your gathering later in the evening. You may want to sit down for this one. Environmental Impact Assessment Review reports that LPG (liquefied petroleum gas) is more efficient and has a lower carbon footprint than charcoal (349 kg vs 998 kg). Grilling with charcoal is as American as apple pie so we won’t hold you to the propane…but if you’re willing to try propane in the name of conservation…we tip our hat to you. Wash tablecloths and save extra napkins for next years party. It make take some time to pack the decorations away but next year you’ll be happy that you did. Instead of purchasing fireworks for a personal backyard display opt for attending a public fireworks display. The fireworks will be bigger, more colorful and save you money. Its so tempting to purchase cases of bottled water but those bottles add up and can spend hundreds of years in a landfill if not recycled properly. As host your guests will follow your lead, so if they see you recycling odds are they will too! Thanks to Earth 911 for sharing these tips and to FWCNB.org for the photo. Imagine the Great Wall of China. Now imagine a wall of trees…in Africa… and you have the “Great Green Wall”. This idea was the brain child of African leaders charged with fighting desertification in their countries. Desertification is the transformation of habitable land into desert and has become a serious problem across Africa. The Wall, which is expected to cost $119 million will begin in Senegal and end in Djibouti, stretch 4,400 miles and be nine miles wide. The project will use drought-resistant native species to filter rain water into the ground helping to minimize soil erosion. There is no word when the project is slated to begin but the wall is seen as a great tool in helping to stop soil erosion and poverty in Africa. Do you think this concept could work in the US? Where would this type of project be most effective? What do you know about CFL’s? One of the easiest ways to make your home more energy efficient is to switch your traditional incandescent light bulbs to CFLs (or compact fluorescent light blubs). Some CFLs use up to 75% less energy than traditional blulbs. There is a higher upfront cost, but CFLs last much longer and will give a quick return on your investment. So you say…well I knew that! But would you know what to do if a CFL were to break in your home? Because CFLs contain mercury they must be handled carefully. The EPA recommends taking these steps to ensure the safety of yourself and your family. If clothing or bedding materials should come in direct contact with broken glass or mercury-powder from the CFL the clothing/materials should be thrown away. Do not wash these materials as the mercury fragments in the clothing may contaminate the machine and pollute the sewage. You can wash the clothing or other materials that may have been exposed to the mercury vapor from a broken CFL, such as the clothing you were wearing when you cleaned up the spill. Just be sure that the clothing has not come in direct contact with the materials from the broken bulb. If shoes come into direct contact with broken glass or mercury-containing powder from the bulb, wipe them off with damp paper towels or disposable wipes. Place the towels or wipes in a glass jar or plastic for disposal. Immediately place all clean up materials outdoors in the trash or protected area for the next trash pickup. Check with your local trash disposal requirements in your specific area. If you have a broken CFL please contact your waste disposal company for disposal requirements. Usually I would not recommend this but there’s a first time for everything. Be sure to print this post and put in your home for quick reference. It’s a Saturday morning driveway ritual throughout America, washing your vehicle. Did you know that this is one of the worst things you can do to the environment? Washing your car sends an average of 80-140 gallons of water carrying break dust, oil, gasoline, detergents, tar and other contaminants into storm drains. This water then flows UNTREATED into lakes and streams. How do you keep the environment clean….while cleaning your vehicle? Its simple. Move your car from the driveway (or hard pavement) to the lawn or gravel surface where the water is absorbed into the ground. The contaminants are still there….but the soil will filter out the pollutants leaving cleaner ground water. Washing your car on a porous pavement not an option? Try a biodegradable or phosphate-free soap or a newer waterless product which are now on the market. What’s even better? Taking your vehicle to a commercial car wash facility is the best option. Automatic car washes on average use half the water as a DIY wash and commercial car washes are bound by law to route their water to sewer systems where the water is treated before returning to water bodies. Some car washes even recycle most of the water used at the facility. If your organization usually raises money by washing cars, think about selling coupons or vouchers to local commercial car wash facilities….you’ll raise money and protect the environment. Keeping your grass green in the middle of the summer in Georgia can be a daunting task even for the most seasoned “green thumb”. Water stressed lawns quickly turn brown and succumb to the summer sun. So to overcome this people use sprinklers and irrigation systems to water their GRASS. 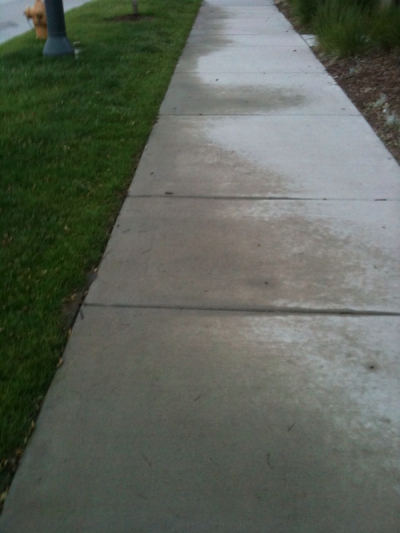 But you see it everyday..in your neighborhood…at the shopping center…..at your job….sprinklers watering the CONCRETE. If you use a sprinkler make sure to position it so that the majority of the water reaches your grass and plants. Consider a sprinkler with a timer to avoid watering during the hottest part of the day when water will evaporate before it can reach the roots of the grass. Some timers even include a rain delay so that you can take advantage of a gift from Mother Nature. If you find that you’ve adjusted your sprinklers and you’re still watering the concrete…try collecting the “concrete” water in buckets and use it to water indoor plants. Or you can move your car onto the concrete that’s being watered and enjoy the carwash. Thanks to Good Human the info! After oil, coffee is the second most globally traded commodity. Rainforests and the habitats of endangered species are often cleared to make room for this cash crop. So how do you make certain that your morning cup of Joe is not contributing to the degradation of the environment? Choose Shade Grown….or Bird Friendly coffee beans. These coffee beans have been grown on plantations with a natural tree canopy above the fields. The shade provided by tree cover allows orchids, insects, reptiles, small mammals (bats) and birds to flourish. There is a certification process that coffee farmers must complete for their beans to be considered shade grown. Unfortunately this process can be expensive causing many farmers to forgo the process and causing the beans to be pricey. 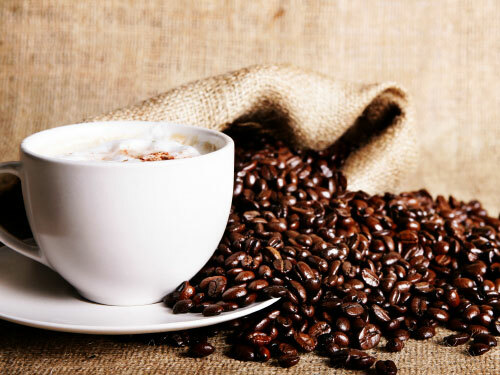 If you buy popular commercial blends as most of us do (think Maxwell House and Folgers) there is no way to know where the coffee beans originated. But all is not lost, you can still make your coffee drinking experience a little more “green”. Conserve resources by eliminating the use of disposal cups/lids, stir-sticks and filters in your home or office. Fill up with a reusable mug or….if you forget, use a disposable cup, wash it and reuse again. Most disposable coffee cups and lids can be used several times before they are thrown away. Thanks to Go Green Street for bringing this to our attention. Try using a clothesline. In the Georgia sunshine the clothes will dry surprisingly fast and smell terrific. Need to dispose of cooking oil? Don’t put it down your drain…it may foul up your drain lines causing a backup. It could also end up in our waterways. Let it cool, collect it in a container and put it in the garbage. Keeping your microwave oven clean will maximize cooking times, which will lessen energy use and cooking times. 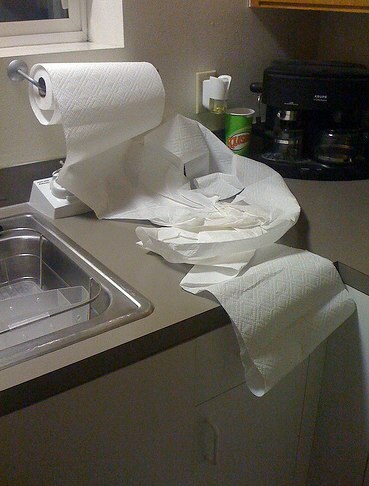 Select paper towels with smaller sized sheets to extend the life of each roll. Rethink preheating your oven. The tradition of preheating an oven began when people baked in wood or coal powered ovens. And getting the fuel up to temperature was a critical part of the baking process. These days ovens are fairly accurate and preheating may not be necessary when baking foods that require an hour or more. Keep it shut….the refrigerator that is. The fridge is the biggest drain of energy in your kitchen and opening the door accounts for $30-60 of your energy bill each year. Only run dishwashers and washing machines with full loads. You can also skip pre-rinsing the dishes before putting them in saving up to 20 gallons of water per load.